With its ceramic-coated barrel that emits negative ions and closes hair cuticles whilst locking in moisture and reducing frizz and flyaways, the Professional Ceramic Round Hair Brush XL 43mm from Balmain is an essential styling tool for enviable tresses. Furthermore, the coating ensures fast and even distribution of heat from root to tip, while its extra-long barrel allows you to blow-dry large sections of hair to enhance drying time. 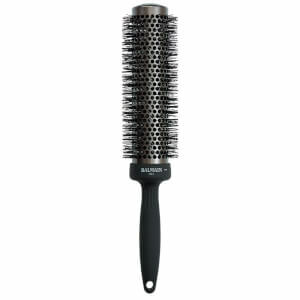 Featuring an ergonomic design with a seamless handle and large vent holes to maximise airflow, the brush’s diameter of 43mm makes it ideal for blow-drying medium to long hair while its extra-long barrel allows you to experience locks that are calm, manageable and healthy-looking.